Peregrine Wildoak has done a very interesting post on the Golden Dawn mystical repast and the prayer of the Hierophant here. There are a few things I want to add to it and it got out of control for a comment. There is a lot going on here. The Hierophant standing in the position of the Cross is invoking the Order contact to link to the candidate through the agency of the password of the Aeon. The password is changed by the chief adept crucifying themselves in just this manner. Much of the 0=0 is focused on links between the candidate’s higher self, but this point is where the link is made to the teaching spirit behind the order. The gesture of standing in the form a cross is important (probably more than the prayer). It is the sign of Osiris Slain (although the candidate does not know it) and symbolic sacrifice made by the candidate and the order so that the Higher may manifest. In many ways, the red cross is a symbol of the teachings and workings of the Order which causes the symbolic death of the candidate. Invoking it is drawing the Order’s contact. 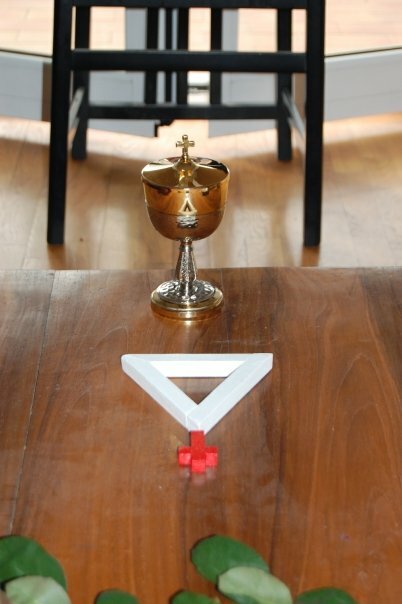 But this is not the only thing that happens as the prayer is made, much as a priest would do, for the candidate (in fact for many years when I have done Hierophant I have turned to the east to say it). Interestingly this prayer was not part of the original ritual and is SM. The prayer cannot be found elsewhere either. This creates a very interesting magical event. Though the sacrifice of the candidate (on their knees) the Hierophant (in a cross), the Supernal Triad inverts and points downwards to connect to the Hierophant and the invisible parts of the candidate. What is created is the same hexagram which can be seen on the northern part of the Lesser Ritual of the Hexagram. 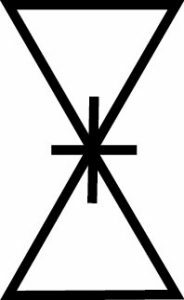 What is different is that instead of a solar circle in the middle joining the two triangles there is a cross (which is an implied solar symbol). In the SM The elements are placed by the Kerux under the protection of the four sons of Horus so they are specifically connected to parts of the physical body. These organs have correlation to feelings etc which are important to the incarnate personality. In their natural state they anchor the person to their body. They are purified by the sons of Horus and returned at the end of the ritual so that they no long have this limiting effect. If they were not important to the candidate and their earthly life they would be destroyed (much like the Ancient Egyptians did with the dead person’s brain). The elements are then effectively the candidate’s four-fold personality as represented by the elements.